'People's Court' Judge Joseph Wapner Dies At 97 : The Two-Way The People's Court was one of the biggest hits among syndicated reality TV shows. Judge Joseph Wapner was joined on the show by real-life bailiff Rusty Burrell and host Doug Llewelyn. Retired Los Angeles Judge Joseph Wapner presided over The People's Court from 1981 to 1993 — deciding real, small-claims cases. The judge's son, David Wapner, told The Associated Press that his father died at home in his sleep after being hospitalized a week ago with breathing problems. He had been under home hospice care. 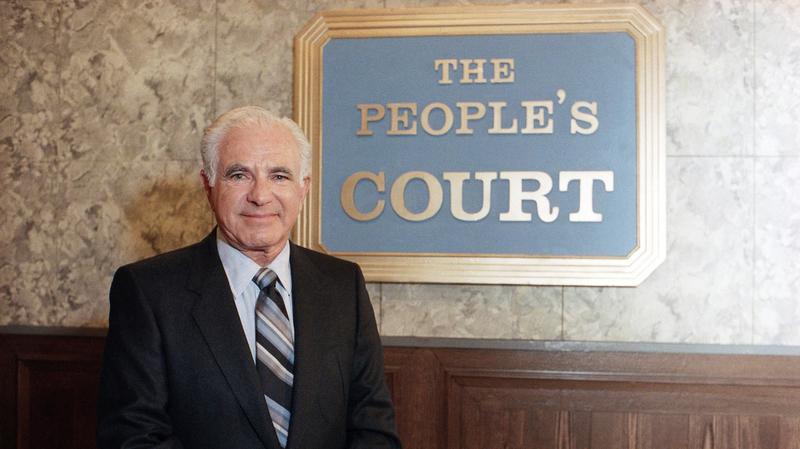 Wapner auditioned for The People's Court shortly after retiring in 1979 from Los Angeles courts, where he had been a judge for more than 20 years. At one time, he was the presiding judge of the Los Angeles Superior Court, the largest court in the United States.
" 'Everything on the show is real," Wapner said. "There's no script, no rehearsal, no retakes. Everything from beginning to end is like a real courtroom, and I personally consider each case as a trial.
" 'Sometimes I don't even deliberate,' he added. 'I just decide from the bench, it's so obvious. The beautiful part is that I have carte blanche.' "
Before a case was accepted for the show, the plaintiff and defendant had to sign a binding arbitration agreement; the show paid for the settlements. Wapner was born on Nov. 15, 1919. "Joseph Albert Wapner graduated in 1937 from Hollywood High School, where he briefly dated the future film actress Lana Turner, and in 1941 from the University of Southern California, where he received a bachelor's degree in philosophy. "During World War II, he served with the Army in the Pacific and was wounded by sniper fire on Cebu Island in the Philippines, leaving him with shrapnel in his left foot. He won the Purple Heart and the Bronze Star for his bravery and was honorably discharged in 1945. "After earning his law degree from the University of Southern California in 1948, Judge Wapner worked in private practice as a lawyer for nearly a decade, until Gov. Edmund G. Brown of California appointed him to a judgeship in Los Angeles municipal court in 1959. Two years later, Judge Wapner was elected presiding judge of the city's vast Superior Court system, in which he supervised some 200 fellow judges." Judge Wapner was joined on the show by real-life bailiff Rusty Burrell and host Doug Llewelyn. At the time, The People's Court was one of the biggest hits for syndicated reality TV shows. A poll conducted by The Washington Post in 1989 found that while two-thirds of those surveyed could not name any of the nine justices on the United States Supreme Court, 54 percent could identify Judge Wapner as the judge of The People's Court. A previous version of this post misspelled Doug Llewelyn's name as Llewellyn.